Call of Duty’s first DLC pack is here, and it brings some much-needed variety to the maps and a (slightly) more interesting Zombies experience. “The Resistance” arrived on January 30 for PlayStation 4, and should be available on Xbox One and PC one month from now. Resistance includes four multiplayer maps and one Zombies map that continues the storyline from The Final Reich. Here’s what I thought of the new maps. With a meager nine maps that shipped with WWII, the game sorely needed more to round out the playlist. It got three. 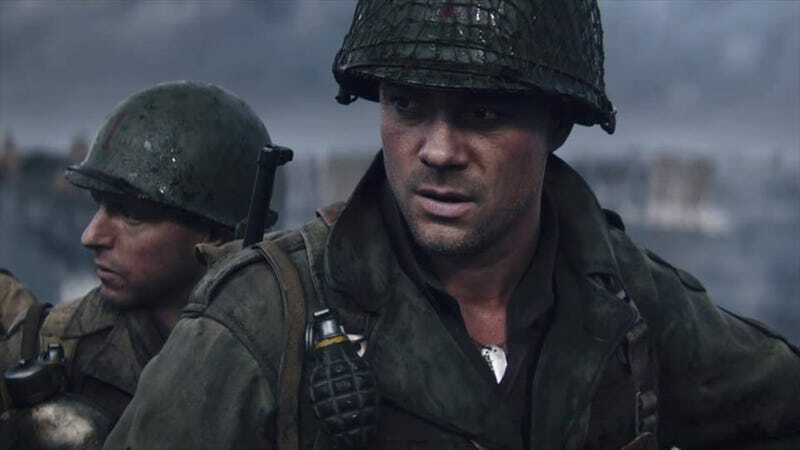 Four multiplayer maps per map pack has been the standard for Call of Duty for some time, but one of the four is now reserved for WWII’s War mode. Anthropoid is inspired by “Operation Anthropoid,” which was the code name for a famous assassination attempt on high-ranking German officers in Prague. It’s also now WWII’s largest standard map. There are several sniper points and plenty of routes to flank your opponents. You can even drop down into the water for a swim or sneaky snipe from the river. Anthropoid serves well for intense objective gameplay, but with a map of this size, you have to be fast at playing the objective of collecting enemy dog tags in Kill Confirmed. Occupation is a remake of the Resistance multiplayer map from Modern Warfare 3 and puts players on the streets of Paris. The reskin feels spot on with the classic map, providing nostalgia for old-school fans. Oddly enough, this map was just remade in the Call of Duty: Infinite Warfare DLC last year, but that version was heavily changed and didn’t flow as well. WWII’s remake is far superior and plays great for objective modes. Valkyrie draws inspiration from The Wolf’s Lair, a collection of bunkers in East Prussia that served as headquarters for Hitler. The arrangement of bunkers makes a deadly playground for anyone wielding a shotgun. There are also mounted MGs and plenty of cover. I personally enjoy the look and flow of the bunkers on this map. However, the spawns are very limited unless you’re playing Hardpoint, so it’s really easy to spawn trap the enemy team or become the victim of spawn traps. WWII only shipped with three War maps, and the expansive Battlefield-style mode has been feeling a little stale. “Resistance” adds one more map. Operation Intercept serves at the new team-objective War map, and while one objective is now to rescue or hold hostages, this new addition to War feels like more of the same. The buildings of Operation Intercept provide great cover for the defending team, and you really have to attack with tactical teamwork, often feeling as frustrating as the attacking side of Operation Neptune. Smoke is definitely your friend on this map. The Darkest Shore brings the next chapter of Sledgehammer’s Zombies storyline. Taking place just days after the horrific events of The Final Reich, the map available at launch, the crew now follows intel that leads them to a foggy island north of Germany. Given that Sledgehammer Games’ co-founders and many other members were once the team behind the Dead Space franchise, it’s not surprising to see a new creature with extra limbs that is reminiscent of the Necromorph. As long as you have ammo in your gun, zombies aren’t really a huge problem. The threat comes during intervals of nasty fog. You literally can only see two steps in front of you, and when the undead are chasing you, it’s a really bad time to run into a dead end. Pair the hindrance of thick fog with the narrow passages of the bunkers and trenches and The Darkest Shore can feel claustrophobic and very unforgiving. The eerie ambiance of The Final Reich carries over to the DLC, but the map’s layout makes high rounds a little more challenging this time around. The wonder weapon is a saw melee weapon that can be upgraded to shoot saw blades, so that’s pretty cool. There’s also a minecart system that provides helpful navigation across the map. Unfortunately, better Zombies is still not great Zombies. The mode continues to lack the addictive replayablity of Treyarch’s iconic Zombies modes, or even Infinite Warfare’s goofy version. WWII Zombies still doesn’t seem to resonate well with the casual players or long-time fans of Zombies. And Sledgehammer even removed a few of the positive features from The Final Reich by excluding a casual Easter Egg and removing the notebook guide for the objectives. The notebook is there, but it won’t guide players anywhere. Why fix something that isn’t broken? Overall, I’ll call the Resistance DLC a welcomed addition to WWII simply because the game desperately needed larger multiplayer maps. The launch offerings suffered from lack of variety since many of the nine maps were on the smaller size, and Anthropoid and Occupation have a good size and layout to serve most game modes and playstyles. A more interesting and challenging Zombies mode is also nice, but The Darkest Shore doesn’t really bring much hope for Zombies fans looking for more fun and higher replay value.